Keswick is one of the prettiest towns in the northern part of the Lake District in Cumbria. It is located just north of Derwentwater and a few miles south of Bassenthwaite. The town is most famously associated with the great English poets, William Wordsworth, Samuel Taylor Coleridge and Robert Southey, who were inspired by the area’s natural beauty. There has been a settlement at Keswick since the 1200s, when Edward I gave permission for a market to take place. Over the years the fortunes of the town have changed considerably, as it moved from a rural economy to an industrial one with the discovery of important minerals in the local area. Today many people visit Keswick to enjoy the local scenery and outdoor pursuits. Overlooked by towering mountains, Keswick is a busy place, particularly in the peak summer months. Visitors come in their droves to take a boat ride on Derwentwater and enjoy a break from strenuous walks in the local area. But whilst the local scenery is the main attraction, there are also plenty of other things to see and do in Keswick. 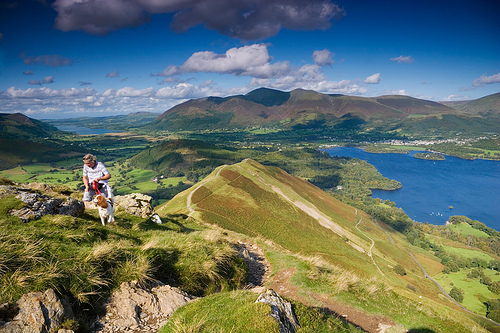 Keswick lies on Derwentwater, one of the largest bodies of water in the Lake District. Boat trips depart from Keswick daily during the peak holiday season, and a boat ride is a lovely way to see more of the local area. If you enjoy water sports, kayaking and canoeing is available, plus a whole host of other exciting outdoor activities such as rock climbing, paddle boarding and ghyll scrambling. There are plenty of shops to explore if you want to pick up some local arts, crafts and gifts. Lakeland knitwear is always a popular choice. The Saturday market takes place every weekend and attracts locals and visitors alike; there is also a market on Thursdays, except in bad weather. The Tourist Information Centre in Keswick is located in Keswick Moot Hall, an interesting building in the centre of town that was a prison and town hall in its former life. If you want to visit the theatre whilst in Keswick, the Theatre by the Lake is a modern, purpose built theatre, which was built to replace the old Century Theatre. One of the most popular attractions in Keswick is the Pencil Museum. Black lead was discovered in the 16th century and before long, pencil making became a major local industry, which it still is today. The Cumberland Pencil Museum tells the story of how pencils are made; there is also a shop where you can buy pencils made in the town. The Keswick Museum & Art Gallery offers visitors a taste of local history. Hope Park is a beautiful outdoor space between the town centre and Derwentwater – don’t forget to stop for a cake! Beatrix Potter also has strong links to the local area. Beatrix spent many summers at Fawe Park and Lingholm, two stately homes and gardens situated on the northern shores of Lake Derwentwater. The Honister Slate Mine is a great opportunity to learn more about the local slate mining industry.